There has been a great deal of controversy of late concerning the symbol of the skull and crossbones and whether or not it should be regarded as a legitimate Masonic emblem. This article is an attempt to demonstrate that this symbol is indeed authentic in its Masonic association, for it both conceals and reveals genuine mysteries pertaining to our Craft. 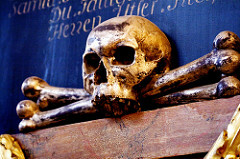 Considering the fact that the skull and crossbones continue to be a common addition to chambers of reflection and third degree tracing boards of many Masonic jurisdictions as well as a prominent feature within the Templar and Kadosh Degrees of the York and Scottish Rites, it would seem to me that the symbol's legitimacy is, if the reader will allow the parlance, a "given," but unfortunately for many Masons, the connection between the seemingly macabre emblem of the skull and crossbones and our gentle Craft is one which remains obscured by what in all probability are simply and understandably the shadows of their own ill-founded fears and insecurities. The association of the symbol of the skull and crossbones with notions of piracy and poison has no doubt left many Masons desirous of distancing themselves and indeed the Fraternity from these and similar emblems. Memento Mori.1 It is natural to fear death, but we as Masons are taught to view that inescapable moment not as something to dread but rather as the motivating factor in accomplishing our own work and duty as men and as Masons. For this reason we are given a sobering reminder every time we have the fortune to sit in Lodge during the raising of a fellow of the Craft to the Sublime Degree of Master Mason or during the Knighting of a Mason as a Templar or Knight Kadosh that death is always near and that it could come at any place and any time, regardless of the person or persons involved. 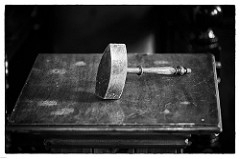 Be it in the chamber of reflection in the jurisdictions where one is permitted or required, the tracing board of the Master Mason degree, the Knighting ceremony of the Order of the Temple in the York Rite or the Knights Kadosh Degree in the Ancient and Accepted Scottish Rite of the Southern Jurisdiction, that which stands as the primary reminder of the grim truth that death is ever imminent is the chilling human skull and crossbones. However, the symbol also has an esoteric application which is equally if not more profound in its relevance. Q. Have you any Key to [the Secrets contained in the Lodge]? Q. Where do you keep it? A. In a Bone Bone Box that neither opens nor shuts but with Ivory Keys. Q. Does it hang or does it lie? Q. What does it hang by? A. A Tow-Line 9 inches or a Span. Q. What Metal is it of? A. No manner of Metal at all; but a Tongue of good Report is as good behind a Brother's Back as before his Face. A similar exchange, appearing in the Sloane Manuscript, led historian Tobias Churton to declare outright that indeed "the Lodge is in the head. "4 This suggests that the Lodge, furniture, ornaments, and officers may all have their reflection within the make-up of man. Sufi-inspired Russian mystic, G.I. Gurdjieff, offered a similar teaching. According to Gurdjieff, every man, not unlike a perfect Lodge, has an internal sevenfold constitution which he termed the "Seven Men." This notion is not unlike the Theosophical teaching concerning the septenary nature of the soul of man, an interpretation which has, since the occult revival of the 19th century, consistently been extended by authors such as Manly P. Hall, J. S. M. Ward, and W. L. Wilmshurst to the seven officers which constitute a perfect Lodge. More recently, in his formidable book, Freemasonry: Symbols, Secrets, Significance, W. Kirk McNulty applied a decidedly Jungian solution to the problem of Masonic ritual, placing the Lodge, candidate, and officers squarely and neatly within the conscious and unconscious mind; that is, inside of the head. The crossbones also have an intriguing Masonic application. In the guidelines provided by the Grand Lodge of Colorado for implementing and conducting a proper chamber of reflection, Masons are informed that "[t]he crossbones are also a hint at the pillars, the portico of man upon which he must stand as he labors in the quarry. "6 As Matthew C. Pelham, Sr. demonstrated in his thought provoking article "A Search for More Light in the Symbolism of the Skull and Crossbones," the association between the crossbones, which themselves are always constructed using human femurs or thighbones, and the two pillars of the Temple, stems no doubt from the verse in Song of Solomon which announces in a moving hymn to Deity that "His legs are as pillars. "7 Still, there is another similarity between the pillars of the Masonic Lodge and someone's (or, more specifically, something's) legs which is so absolutely striking that I dare not fail to mention it. In the Greek myth of Jason and the Argonauts, the ship Argo sailed to Europa in Crete following Jason's legendary retrieval of the golden fleece. On the island of Europa, the Argonauts encountered a great metallic giant called Talos, meaning sun or solar, which was cast wholly of solid bronze. His legs, on the other hand, while also made of bronze, were cast completely hollow, and one of them, it was said, contained a single vein through which flowed the divine ichor or golden blood of the gods. The presence of the ichor within his leg animated the giant, enabling Talos to perform the sole function for which he was created, that is to circumambulate Europa three times daily in order to protect and guard the land from approaching pirates. If the reader will recall, the Pillars of Freemasonry are also said not only to have been hollow and cast from bronze, but according to some traditions within the Craft, it was only one of them which contained the treasured archives of Freemasonry, not unlike Talos' peculiar legs, only one of which was possessive of the Olympic gods' magical ichor. Lastly, it is notable that scholar A. B. Cook interpreted the myth of Talos as being a veiled allusion to the Masonically relevant lost wax casting method of metallurgy thus bringing us back full circle to the question of the legitimacy of this symbol. Regardless of the negative connotations which may surround the image, the symbol of the skull and crossbones, whether considered exoterically or esoterically, is absolutely possessive of profound Masonic import. As we have demonstrated, the image is suggestive of both man's mortality and more significantly, initiation within the Masonic Lodge. We are hopeful that we've aided our more uncertain Brethren in laying aside some of their underlying fears and insecurities concerning this most curious and potent of Masonic emblems. The symbol of the skull and crossbones points at once to the inevitable end of man as well as to one of the means by which he might accept and come to peace with the knowledge and anticipation of such an ending, tried and true Masonic initiation. For Information on Bro. Newman's newly release book: Alchemically Stoned: The Psycedelic Secret of Freemasonry, Click the book cover.